Donna Belle (Adkins) Fastle, 78, of Earlham passed away on Tuesday, November 20, 2018 at the Community Care Center in Stuart. Memorial services will be held at 11 A.M. on Monday, November 26th at the First Presbyterian Church in Earlham. Visitation will be one hour prior to the services at the church. Burial will be at the Earlham Cemetery. Memorial contributions may be directed to the Earlham Fire and Rescue and sent in care of Johnson Family Funeral Home, PO Box 119, Earlham, IA 50072. Online condolences may be left at www.johnsonfamilyfuneralhome.com. Donna was born on August 28, 1940 to Fred and Wilma JoAnn (Cox) Adkins in Dexter, Iowa. She grew up in Pitzer and attended Pitzer School until the 8th Grade. As a young girl she worked at the Pitzer Country Store. She graduated from Earlham High School with the class of 1958. She married her high school sweetheart Wayne Fastle in 1961 in Pitzer. To this union two daughters were born, Susanne and Jeanette. The family made their home in Earlham; where Donna resided until moving into the Stuart Community Care Center in 2016. Donna worked for few years as a bookkeeper in the Liquor Control Division for the State of Iowa. She then stayed home for several years with her daughters. She held a part time job at the grocery store before going to work at Harris Construction as their bookkeeper. She later joined Wayne to driving for their semi-truck business. Donna drove for several years and for many years they were on the road for 360 days a year. After trucking she changed careers again and worked until retiring at Fiserv, a financial institution statement processor. 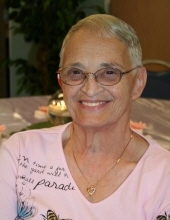 She was a lifelong member of the First Presbyterian Church in Earlham where she was a skilled organist for many years. For many years she enjoyed being a member of a bridge club. She also treasured the time she spent with her grandchildren and family. She was preceded in death by her parents, Fred and Wilma JoAnn Adkins; and sister, Janice Fife. She leaves behind her husband, Wayne of Stuart; daughters, Susanne Jones of Earlham and Jeanette (John) Fullerton of Willow Spring, NC; granddaughters: Chelsea (Joel) Roney, Haley (Robert) Schaeffer, Taylor Fullerton, Kayla Hull; great-grandchildren: Lucas Mizzell, Cadence Roney, Hunter Schaeffer; and a host of extended family and friends that will miss her dearly. To send flowers or a remembrance gift to the family of Donna Belle Fastle, please visit our Tribute Store. Luncheon will follow the committal service. "Email Address" would like to share the life celebration of Donna Belle Fastle. Click on the "link" to go to share a favorite memory or leave a condolence message for the family.